After four days in Brussels - a black hole on the Cycle Chic map - I took the train to visit Marc from Amsterdamize. It was fantastic to return to a real bicycle culture. I felt quite at home. I'm still sorting through my photos but figured I'd get a couple up today. Here's Marc from Amsterdamize. Bloody cyclist got in the way. A big ouch for Brussels, but I can't deny it. Next time you are around, let me know and I'll show you Antwerp and Ghent. Btw, people can now tell we sat to close together while observing all that chic ;-p.
Enjoy the rest your days until your Big In Japan Tour! I understand forcing people to come from the rss feed to the blog boosts the hits in your stats but honestly I am getting tired enough of this to unsubscribe and simply check in now and then. You are actually making one of the most common errors in loosing readership. you look great marc.. the cyclist in the photo is a great accessory! 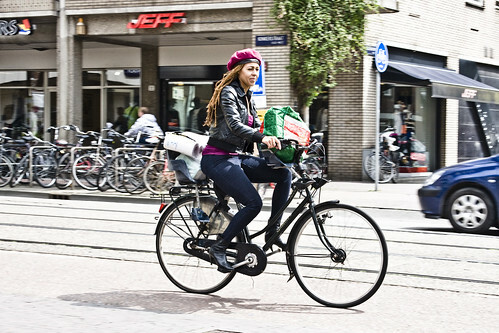 both Amsterdamize and Copenhagen cycle chic help to change the minds of car bound candadian people..
thanks for your kind words, Chiara!